See me! Feel me! Touch me! That’s a lyric from the Who's Tommy, but it also describes the sensations that swim in your head when you look at photos by Harry Benson. There's music in them, as well as spontaneity and heat; they're alive in ways still camera images rarely are. That vitality is an essential part of the great Scot himself, a livewire from Glasgow who just turned 87 without losing the sharp burr on his tongue, the green pocket squares that dot his jackets or the witty glint of challenge that shines out of his eyes – and his photographs. Ever since the world marveled at his iconic black-and-white images of the Beatles pillow-fighting in a hotel room and horsing around on their inaugural American tour in 1964, Benson has been known for snapping celebs – he's captured them all from Elizabeth Taylor and Michael Jackson to Donald Trump. But the term celebrity photographer is way too limiting. It's the world that has always been his subject, whether in a war zone, on a civil rights march with Martin Luther King or right at the center of intense human agony, which found him camera-ready at the assassination of Bobby Kennedy. He's a complicated artist, that Harry. 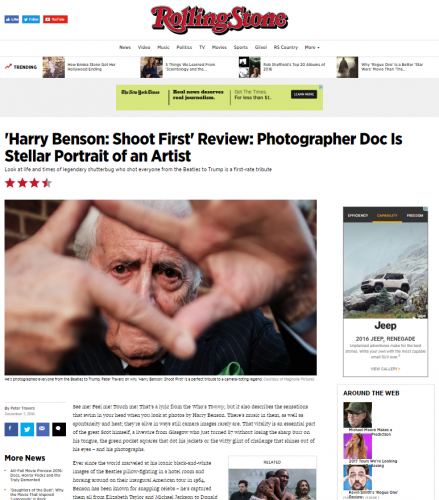 And he's captured in all his funny, feisty, gritty and graceful complexity in Harry Benson: Shoot First, a spellbinder of a documentary from Justin Bare and Matthew Miele that plays like one of his photo sessions, caught on the fly and filled with insights on the periphery of the frame. Sure, there are plenty of talking-head interviews with the likes of Trump, Joe Namath, Sharon Stone and Harry's daughter, who speaks movingly of a father who always put work first. But what work! His great photographs practically jump off the screen in a series on montages that take the breath away. Bare and Miele do more than track a remarkable career here; they reveal the essentials of what makes Benson unique. Any paparazzo with moxie can get into the action and shoot first. But what this shutterbug's eye arranges, sometimes in a split second, is the work of a singular craftsman with a rare gift: raising the click of a camera shutter to the level of art.